Solar CFL Home Lighting System, provided by us, is used to provide electricity where conventional supply is irregular and not easily obtainable. Our Solar CFL Home Lighting System comes in various models to suit customerâ��s requirements with light boosters. Solar CFL Home Lighting System is highly reliable and easy to install. Also, there are optional facilities like charging from mains and timer to control duration of lighting. All models of Solar CFL Home Lighting System come with SPV module solid state charge controller, battery box, interconnecting cables, switches. Luminaries for 3 to 4 hours duration with necessary wiring for the complete system. 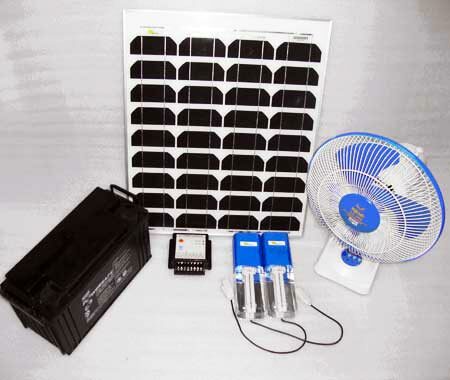 Solar Home Light System can be utilized as an alternative towards efficient cost-cutting for heavy electric bills in urban area, as well as is the best lighting solution for remote area people in rural villages.